Ted Butler: Has the worm turned in the silver futures market? According to newly uncovered information in the gold market, it provides additional evidence of why the Fed, Central Banks and the IMF were forced to RIG the gold market. Not only was the dropping of the Gold-Dollar peg going to release a great deal of pressure on the manipulated gold price, but forecasts of a massive increase in gold demand was going to totally overwhelm supply. Thus, this new information provides clear evidence that the gold market was being assaulted on "two fronts." Not only was the gold market suffering from a decades of price suppression schemes via the Fed and Central Banks, but also that surging gold demand in the jewelry and industrial sectors was going to lead to severe shortages in the gold market. Which means, the gold market was experiencing a great deal more stress than complications stemming from the debasement of the U.S. Dollar due to massive money printing. Actually, looking at this new information, I had no idea of the amount of Fed, Central Bank and IMF gold market intervention until I put all the pieces together. PRECIOUS METALS INVESTORS.... if you think your getting the "BEST PRICE" for purchasing gold and silver, or you are receiving the best "FEE" for storing your metals, than you need not look any further. However, if you haven't checked out our new PRECIOUS METALS INVESTING section or our new LOWEST COST PRECIOUS METALS STORAGE page, I highly recommend you do. Not only did the committee suggest and permit the "voluntary" sale of official gold into the market, but also to "prohibit" against Central bank purchases. Which meant the committee was proposing a plan to only allow the DUMPING of gold into the market, but forbid any OFFICIAL BUYING. This of course was supporting the "FREE MARKET" fundamentals for proper gold price discovery.... LOL. But, and here is a BIG BUT... converting Dollars into physical gold was only one part of the monumental problem facing the gold market and industry. 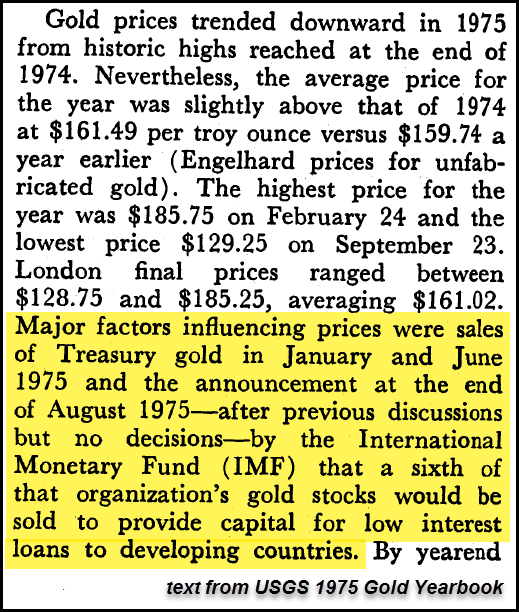 Up until now, this was the only real problem that I was aware of as it pertained to the gold market in the 1970's. However, forecasts of future Gold Supply & Demand factors were going to totally disrupt the market unless the Fed and Central banks stepped in. 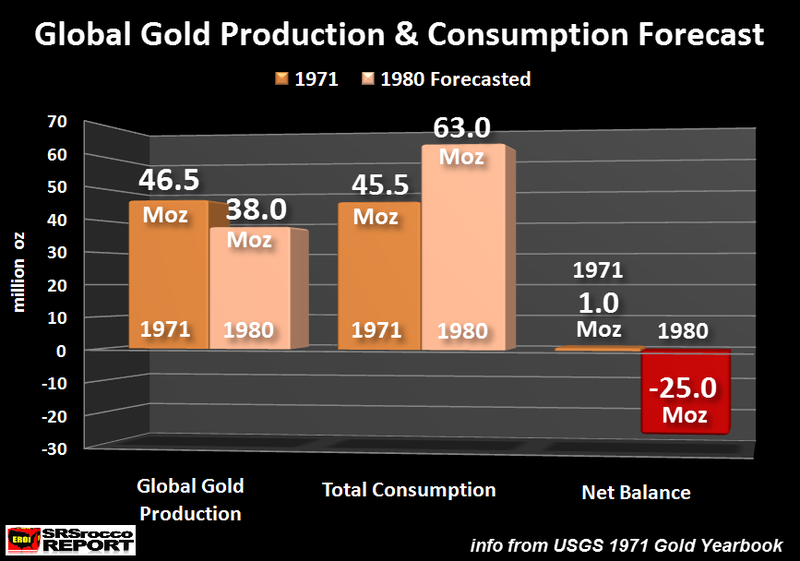 According to a gold expert at Consolidated Gold Fields Ltd., global gold demand was forecasted to reach 63 million oz (Moz) by 1980, up from 42.5-45 Moz in 1972. You see... this was a BIG PROBLEM. Why? 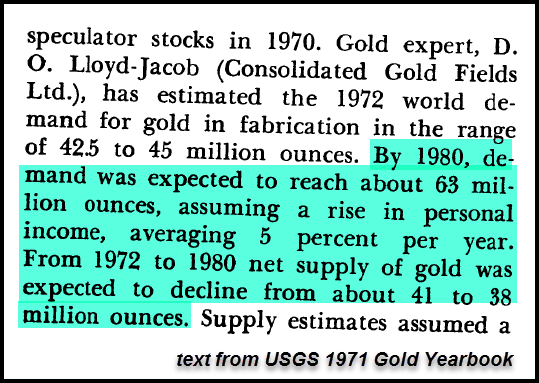 Because gold mine supply was also forecasted to decline to 38-41 Moz in 1980. This would have resulted in a huge net deficit. This just could not fly. 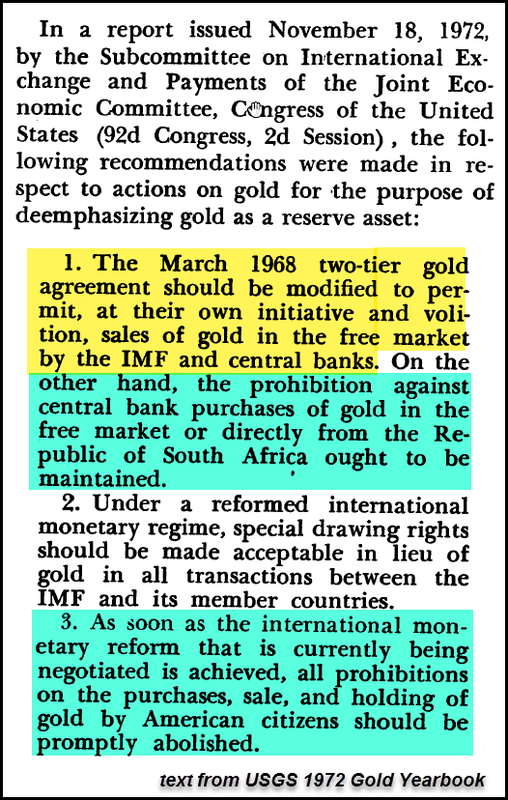 Which is why the Congress and the Subcommittee on International Exchange and Payments (listed above) were highly motivated to promote "Official Gold Sales" while prohibiting "Official Gold Buying." This was a "ONE-WAY PLAN" for gold... and that was the dumping of a massive amount of the yellow metal into the market. 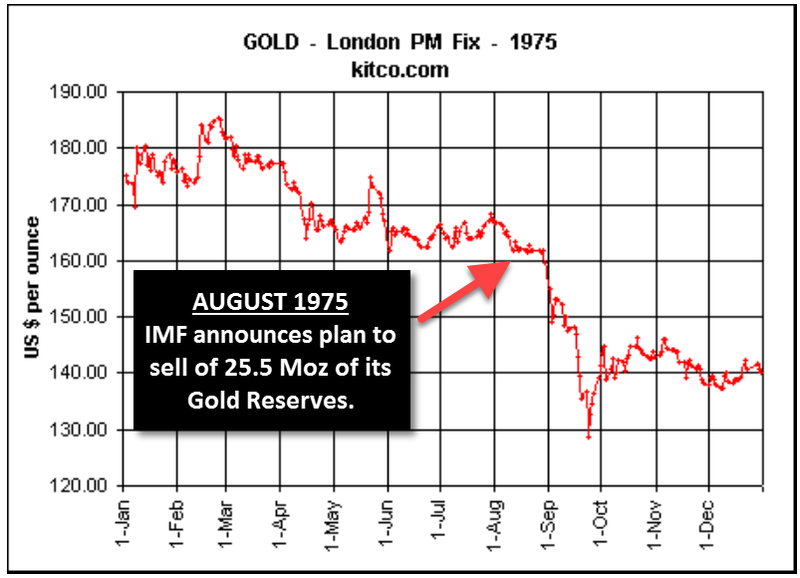 The IMF - International Monetary Fund, announced in August, 1975 to sell one-sixth of its gold stocks. 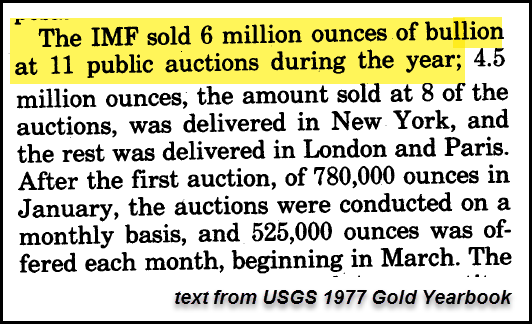 At the time, the IMF held 153.4 Moz of gold. Thus, it planned to sell 25.5 Moz over the next several years to supposedly provide capital for low-interest loans to developing countries. I wonder why the IMF did not make this statement back in 1973 or 1974? And why would the IMF have to sell gold to provide capital for developing countries?? Wasn't there a new FIAT MONETARY REGIME?? After the IMF gold sale announcement, the gold price plummeted 21% in just one month from $165, down to a low of $130. Before I came across this information, I just believed that the gold price was due for a correction.... stated by several websites, such as by analysts on King World News. However, this wasn't a typical market correction. Rather... this was a MARKET INTERVENTION FORCED CORRECTION. Big difference. I have to make a comment here. I spend a lot of time at energy and precious metals blogs. I am completely surprised at the lack of intelligence by individuals who are supposedly very "BRIGHT" in their respective industries. When I hear comments that gold is nothing more than a "13th Century Middle Ages Relic", and that digit currency is the new monetary system... the Good Lord Almighty must be enjoying one hell of a BELLY-ACHING LAUGH. 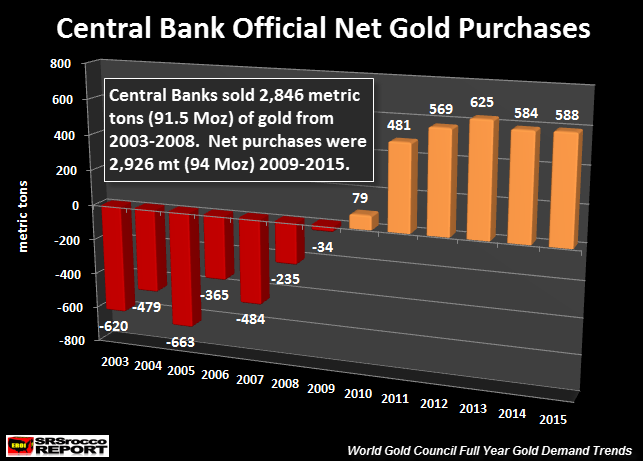 Regardless, the Fed, Central banks and IMF have been rigging the gold market for quite some time... and continue to do so. 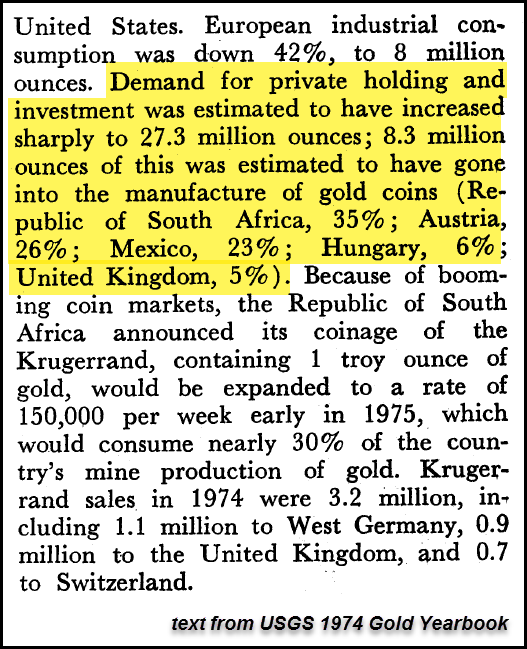 If we include this amount with the sales of foreign gold at the Federal Reserve and other official gold sales, the amount of gold sold during the 1970 decade was quite an impressive amount... probably something north of 50 Moz. Which means, gold became too valuable to be used as money in the U.S. and Global economy. Yes, that sounds strange... but that is the truth. I mentioned this in a previous article on why silver was removed from U.S. coinage. It was due to the same reason. Increase world debt to such massive levels, that interest rates had to fall towards zero.. or negative. Thus creating a 30+ year artificial Bond Market Rally. If interest rates rise... the entire system BLOWS UP. As I have mentioned in several articles and interviews, the timing of this event will be known by what takes place in the energy markets as they are the drivers of our economy... and the highly leverage Fiat Monetary System. Great news America - After soaring to the highest price in three years, wholesale prices for pork bellies, the cut used for making bacon, are heading for a 25% loss over two weeks. As Bloomberg notes, increased demand had more than doubled prices since August, but now bellies are so expensive that the high costs are stemming demand, according to David Kruse, president of Commstock Investments Inc. The premium gasoline that fuels luxury cars made by Mercedes-Benz to Audi has always been more expensive than regular, but the difference keeps getting bigger. As Bloomberg points out, premium costs almost 50 cents a gallon extra, nearly doubling in the past four years. And don’t expect the trend to change -- environmental rules limiting sulfur that kicked in this year could make the higher-octane fuel scarcer and even more costly in the future. Never mind the collapse in real wages. This post The Fed's Getting Ready to Raise into Weakness appeared first on Daily Reckoning. But I've been calling a March rate hike since late December. I was almost alone in that view. Wall Street analysts were paying lip service to the idea that the Fed might raise rates twice before the end of the year, but said the process might begin in June, not March. Market indicators were giving only a 25% chance of a rate hike within the past couple weeks. Is it because I'm smarter than all these other analysts? No, I certainly don't claim to be smarter than any of them. It's just that I use better analytical techniques based on complexity theory, behavioral psychology and other sciences that account for the ways actual markets behave. Meanwhile, most analysts are using outdated, static models that don't apply to the real world. Speculation began after Janet Yellen's testimony to House and Senate committees last month. She said a solid job market and an overall improving economy suggested the Fed would likely resume raising rates soon. But, Yellen did not say anything she hadn't said in December. But suddenly this week everything heated up. Now the markets agree that a rate hike is coming, thanks to an orchestrated campaign of speeches and leaks from senior Fed officials. Several Fed members have been talking about the need to tighten, including Fed Governor and uber-dove Lael Brainard. When she starts sounding like a hawk, it's time to pay attention. As I said, markets are now pricing in nearly a 75% chance of a March rate hike (my estimate is now 90%). But there's a big difference between the dynamics behind my view of a rate increase and the market's view. In effect, markets are saying, "The Fed is hiking rates, therefore, the economy must be strong." What I'm saying is "The Fed is tightening into weakness (because they don't see it), so they will stall the economy and will flip to ease by May." My view is the economy is fundamentally weak, the Fed is tightening into weakness. By later this year, the Fed will have to flip-flop to ease (via forward guidance) for the ninth time since 2013. Stocks will fall, while bonds and precious metals will rally. Both theses start with a rate hike, but they rest on totally different assumptions and analyses. Under my scenario, the stock market is headed for a brick wall in April or May, when weak first-quarter data roll in. But for now, it's still up, up and away. My take is that the Fed is desperate to raise rates before the next recession (so they can cut them again), and will take every opportunity to do so. I believe the Fed will raise rates 0.25% every other meeting (March, June, September and December) until 2019 unless one of three events happens — a stock market crash, job losses, or deflation. Right now the stock market is booming, job creation is strong, and inflation is emerging. So, none of the speed bumps are in place. The coast is clear for the March rate hike. There is a great deal of happy talk surrounding the market right now. But with so much bullishness around, it's time to take a close look at the bear case for stocks. It's actually straightforward. Growth is being financed with debt, which has now reached epic proportions. The debt bubble can be seen at the personal, corporate and sovereign level. Sure, a lot of money has been printed since 2007, but debt has expanded much faster. In a liquidity crisis, investors who think they have "money" (in the form of stocks, bonds, real estate, etc.) suddenly realize that those investments are not money at all — they're just assets. When investors all sell their assets at once to get their money back, markets crash and the panic feeds on itself. What would it take to set off this kind of panic? In a super-highly leveraged system, the answer is: "Not much." There's a long list of potential catalysts, including delays and disappointments with Trump's economic plans, aggressive rate hikes by the Fed, a stronger dollar, and economic turmoil due to China's vanishing reserves or the new Greek bailout. It could also be anything from a high-profile bankruptcy, a failed deal, a bad headline, a natural disaster, and so on. This issue is not the catalyst; the issue is the leverage and instability of the system. The bulls are ignoring the risks. My view is we're well into bubble territory, and stocks will reverse sooner than later. Stocks are a bubble that will certainly crash. But you must realize that the timing is uncertain. Recall that Greenspan gave his "irrational exuberance" speech in 1996, but stocks did not crash until 2000. That's a long time to be on the sidelines. Conversely, bonds are not in a bubble, despite the large number of analysts who make that claim. These analysts are looking at nominal rates. You need to look at real rates, which are still fairly high. Nominal and real yields on the 10-year Treasury note were much higher at the end of 2013 than they are today. Wall Street yelled "bubble" then and shorted the bond market when the 10-year note yield-to-maturity was 3% in 2013. Those who shorted Treasury notes got crushed when yields fell to 1.4% by early 2016 (they have reversed since). I expect another bond market rally (bonds up, rates down) to play out between now and this summer. One source of investor confusion is that the White House and Congress are moving toward fiscal stimulus, while the Fed is moving toward monetary tightening. That's a highly unstable dynamic. Markets could tip either way. Investors have to be prepared for countertrends and reversals while waiting for this picture to unfold. The Trump administration is perfectly capable of shouting "strong dollar" on Monday and "weak dollar" on Tuesday. That's one reason I recommend a cash allocation — it allows you to be nimble. Something else to remember going forward is that Trump will have a minimum of three, and perhaps as many as four or five, chances to appoint members of the Fed board of governors, including a new chairman in the next 10 months. I expect these new governors will be dovish based on Trump's publicly expressed preference for a weaker dollar. The Senate will definitely confirm Trump's choices. So get ready for an extreme makeover at the Fed, with the likelihood of easy money, more inflation, higher gold prices and a weaker dollar right around the corner. That combination of Fed ease (due to slowing) and Fed doves flying into the boardroom on Constitution Avenue in Washington will give gold prices in particular a major lift in the second half of the year. The post The Fed's Getting Ready to Raise into Weakness appeared first on Daily Reckoning. Gold fell $12 to $1223 in early afternoon New York trade before it jumped back to $1236.00 after Yellen raised the possibility of the fed keeping rates stable, but it then drifted back lower into the close and ended with a loss of 0.05%. Silver surged to as high as $17.972 and ended with a gain of 1%. While we expected the gold stocks to correct and test GDX $22 and GDXJ $35, we did not expect it to happen so quickly. It literally took only three days! Gold stocks rebounded on Friday and managed to close the week above those key levels. While gold stocks could bounce or consolidate for a few days, we would advise patience as lower levels could be tested as spring begins. Would you rather have one bitcoin, or a single ounce of gold? The answer used to be obvious. Even at the climax of the legendary 2013 rally, bitcoin was never able to reach unit-for-unit parity with gold. However, since an off-year in 2014, the enigmatic cryptocurrency has steadily climbed in price to take the title of the best-performing currency in both 2015 and 2016. Using the most representative or notable index/ETF for each segment, let’s update the general status for a range of items (U.S. and global stocks, T bonds, commodities and gold) with a few informal thoughts. As it’s older brother, the Dow, exceeds our target (21,000), the S&P 500 lurks just below its target of 2410. While the market can (and probably should) correct at any time, the lack of climactic volume (ref. yesterday’s post comparing the current Dow to Silver in 2011) along with over bullish sentiment that continues to resist becoming massively (as in ‘all in’) over bullish imply that such a correction would be a pit stop, not a bear market. As the Fiscal Year 2018 budget, and particularly its war component are floated, it has become clear that without continued, massive military spending, paid for with mass-produced electrons masquerading as money, U. S. GDP would collapse, taking the country's financial and monetary systems with it. The nation, whose real economy has been hollowed out, for profit, by the Deep State plunderers, has become significantly reliant upon deliberately contrived wars and military tensions for its economic survival. The gold stocks enjoyed a strong surge early this year, fully reversing their sharp post-election losses. While they spent much of February consolidating before sliding, this sector's seasonals will soon turn very favorable again in mid-March. The gold miners have long enjoyed strong spring rallies in bull-market years. Early March's seasonal lull is a great opportunity to deploy aggressively ahead of this big spring buying. The very near future is likely to see a sea-change in central bankers' attitude to the gold allocation in their reserves. The failure of G20 monetary policy since the financial crisis is causing a general rethink, which may eventually lead to a new policy direction. Gold pierced the EMA 20, which has supported it through its 2017 rally. A loss of that level would bring on what I'd see as a buying opportunity at around 1200 and/or the now upturned SMA 50. Gold is in waiting for a counter-cyclical or risk 'off' backdrop; period. Forget inflation as a gold fundamental for now. If stocks correct sooner rather than later, I'd expect more near-term upside in gold. Silver fell a very sharp 85 cents from $18.40 per ounce to as low as $17.65 per ounce yesterday for a 4.25% price fall soon after the London bullion markets closed yesterday despite no market news or corresponding sharp moves in other markets. This post Stock Investors Brace For “Silent Spring” appeared first on Daily Reckoning. Today I’m going to show you how two press releases — posted just two hours apart — spell danger for conventional stock investors. Just like the coal mine canary seems to be a very small thing, this small indicator actually sheds light on a much bigger problem… a problem that most investors are blissfully ignorant of. As a former hedge fund manager, I’ve become very good at reading between the lines. Often, the headlines you read only tell a small part of the story. But if you can connect the dots between what is being said and what is ultimately implied, you can make a lot of money! Case in point: a recent price war that has broken out between two of the largest retail brokers in the business. On Tuesday, Fidelity announced it was cutting commissions on individual stock trades to just $4.95. Hours later, Charles Schwab released its own press release, matching Fidelity’s new commission structure. If you have an account with Fidelity or Schwab, that’s certainly good news for you. It means you’ll be paying less in commission costs when you buy or sell shares of stock. But the question I’m asking is WHY?? Why would two of the biggest retail brokers slash prices and trigger what will certainly be a price war in the industry? Are these two brokers seeing something that the media hasn’t caught in to yet? The price war between Fidelity and Charles Schwab is a battle to capture market share in a declining industry. More and more retail investors are parking their money into passively managed index funds and ETFs. And this takes commission business away from big companies like Fidelity and Schwab. So both brokerages are lowering prices in a desperate attempt to attract investors who actively trade stocks. The important takeaway is that trading activity is lower… much lower. It’s so low that the two biggest brokerages are slashing their prices by almost 40% in single move. Individual investors are basically going on strike, and choosing not to buy shares of stock. And this at a time when the market is overvalued by just about any measure you choose. And here’s the thing… When investors step back and stop buying, it’s only a matter of time before this inflated market starts sliding lower. So the fact that Fidelity and Charles Schwab are aggressively slashing commission costs is a very telling sign about the health of this market. When the market starts to head lower, most stock investors are going to be hurt. I’ve see this time and time again as the market moves through the inevitable boom and bust cycles. Unfortunately, traditional investors never seem to learn, and suffer big losses over and over again. There are steps you can take to protect your wealth, even if the market moves sharply lower. Below, are three specific examples which you can use to insulate your investment account from a market crash, and set yourself up to profit when the market ultimately rebounds. Balance Your Investments — All too often, investors only buy stocks. But there are many other investments you can make which are not tied directly to the stock market. If you’re currently only invested in stocks, I suggest adding some discount bonds, and my Income on Demand strategy — both of which can give you profits even in a bear stock market. Trim Positions With Large Gains — If you’ve held stocks for a long time, you’re probably sitting on some big gains. And that’s a good thing. But after such a long stock market run, it makes sense to take some of those gains off the table. I recommend selling partial positions, that way if the market moves higher for a while longer, you’ll still participate. But you’ll protect some profits from a decline. Be Willing to Hold Cash and Gold — Most investors hate to hold cash in their account, especially with today’s interest rates so low. And one of the criticisms of investing in gold is that it doesn’t pay you any cash flow. But holding some cash and gold in your account will protect your wealth in a falling market. And it will leave you in a great position to buy stocks cheaply after the market moves lower. I’ll be keeping a watchful eye for more signs of danger in the market. It’s been a great run, but now it’s time to add defense to our investment game plan. The post Stock Investors Brace For “Silent Spring” appeared first on Daily Reckoning. I thought I would put today in perspective for those throwing in the towel on gold and silver. Some 23,000 silver contracts were sold in just a few minutes this morning. This equates to 115 million ounces. For perspective, there are only two countries in the world that produce this much in one year, Mexico and Peru. China roughly produces 115 million ounces but the production is not normally sold onto world markets. Looking at this from a "company" perspective, no single company even comes close to producing 115 million ounces. In fact, the three largest silver-producing companies in the world, Fresnillo, KGHM Polska, and Goldcorp, produce only about 125 million ounces combined over a year. Because of these production numbers, today's action, selling 115 million ounces of silver, is an impossibility in any real world governed by any real rule of law. As I have said for years when these raids occur, no one has this much silver to sell, and no one would be stupid enough to sell in this fashion if they were trying to get the best price possible for themselves or their client. As everyone knows, the aftermath of the U.S. presidential election was a disastrous time for the yellow metal. However, gold rebounded at the beginning of 2017, gaining almost 6 percent in January and rising further in February, as one can see in the chart below. Chart 1: The price of gold over the last year (London P.M. Fix). It is common for commodities to drop in unison, says technical analyst Clive Maund, and in tandem with his prediction that oil will drop, he also sees gold and silver going lower. Ron Paul on the dangers of bitcoin and Trump’s foreign policy. Marc Faber on the coming equities “avalanche” decline. Eric Sprott and Andrew Hoffman on why gold is the answer. The post Top Ten Videos — March 3 appeared first on DollarCollapse.com.